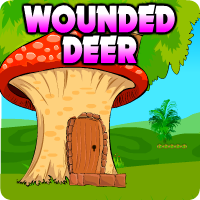 AvmGames - Avm Wounded Deer Escape is another point and click escape game developed by Avm Games. You were walking along the forest when you saw a wounded deer. It's your first time to see a deer in real life so you followed it. But what you saw at the end of the run shocked you. You saw two men who captured the wounded deer. They brought out a cage and they put the poor deer inside. You know that this is not right. So, you patiently waited for them to leave the forest. After few hours, they finally left. You overheard that they will just get the truck so they can bring the deer to the zoo. You saw how happy the wounded deer in its natural habitat and you can't let them take that happiness away. Thankfully, you still have time to help the deer to escape. Good luck and have fun! paper with bicycle....is used more than once in different Scenes. Colors from bicycle paper used on tree in s2. Paper used again in s1 and s5, then disappears from inventory. Axe for the thing in s6 that looks like a gong.